Martin’s Dreadnought Junior Series guitars features a blend of the legendary Martin tone, with solid-wood construction, and lightning-fast playability. The Dreadnought Junior was designed to create an instrument for the player that is searching for a small-bodied guitar that is easy to play, and loaded with all the sound and dynamic nuances of a full-sized acoustic instrument. New to the Martin family of Dreadnought Junior guitars, the custom D Jr. 2A Sapele Acoustic Guitar has all the bells and whistles of more expensive instruments. Constructed of all solid-woods, the D Jr. 2A Sapele produces a tone that will rival some of the more expensive instruments found on the market today. For the top, Martin selected solid sapele as the basis of the tone generator. Sapele is a visually attractive tonewood that is slightly warmer than Sitka spruce. Its warm tone blends nicely with the human voice or musical ensemble. The body is fashioned of solid sapele to add the right amount of depth and character to the sound. Unlike laminate or layered woods that are stiff and lack bottom end and resonance, the solid-wood D Jr. 2A Sapele is an expressive instrument with lots of sustain and tone. Playability is a must for many of today’s musical styles, and Martin has got you covered. The D Jr. 2A Sapele has a very comfortable neck profile. A 24 in. scale length adds more power and tone to the sound, while reducing the drag on string tension. The slim neck profile and forest-friendly Solid FSC Certified Richlite fingerboard allows you to glide up and down the fingerboard with ease. You will be able to make a smooth transition from playing your electric guitar to this acoustic instrument. 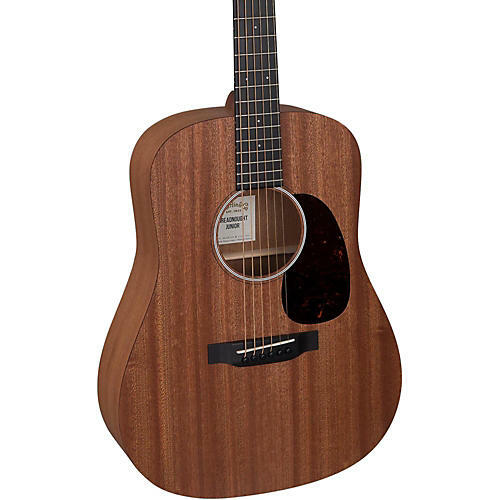 Martin’s D Jr. 2A Sapele Acoustic Guitar has a great sound, fast action and is perfect for the singer/songwriter, stage performer, travel musician, session player and aspiring guitar student. A D Jr. gig bag is included. One year warranty on Martin Backpackers, Little Martins and Ukuleles. Limited lifetime on other Martin guitars.